Happy Friday everyone! Is it just me, or has this week been extremely long? Back to the old routine after the holidays. Well, luckily it means there are a bunch of shows to check out! There is an amazing event going on tonight at the Tiger Bar to cheer you all up or just give your weekend a good start. 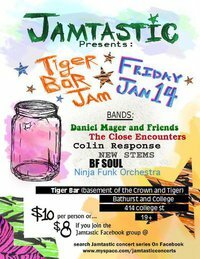 The Tiger Bar Jam will feature a number of Ontario-based band - New Stems, Colinresponse, The Close Encounters, BF Soul, and Ninja Funk Orchestra. I have not seen any of these bands before, but I have been listening to all of them on either their websites or MySpace. Surprisingly, each band has there own distinctive style ranging from acoustic folk to funk rock. My favorite so far is Ninja Funk Orchestra. They have some very catchy grooves. I cannot wait to see each band rocking out on stage tomorrow. The doors are at 8 p.m. Tickets are only for $10.00. However, if you join Jamtastic group on Facebook, cover is only $8.00! Click here to go to the Jamtastic group Facebook page. For the further details about the show, click here to go to the Facebook event page. I hope to see you all tonight at the Tiger Bar and let's make it an awesome one!